Mary Ann, Madeline, James W.
Son of Wick Graves. Worked for Collin County Farmers Mutual Insurance. Born in 1887, Jesse was the son of Wick and Fannie (Fox) Graves. He graduated from McKinney High and worked as a clerk for Kistler & Bristol. He married Mary Ann Duffy and had three children. 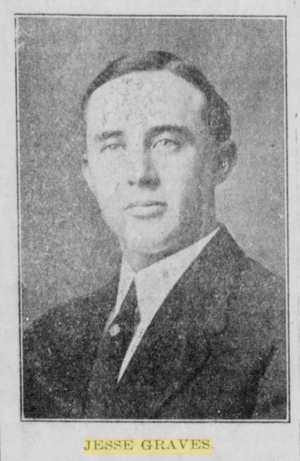 He bought the property at 1108 Tucker Street in 1922 from his uncle and land developer, George W. Fox in the subdivision that bears his name. In 1925, Jesse built the house that now stands. Later, Jesse went to work for Collin Co. Farmers Mutual Insurance located in the Wilson Building at 113% E. Virginia. Samuel H. Fox (1836-1921) In 1850, at the age of 14, Samuel H. Fox arrived in Texas from Missouri with his parents Charles T. Fox and Frances (Herndon) Fox. In 1856, he married Sallie Barnes and began a marriage that would last over 65 years. He enlisted in the Confederacy and fought in the Bank’s campaign and was severely wounded in battle at Yellow Bayou on Norwood’s plantation. He was County Commissioner of Collin County for four terms, 1889-1893. 1899-1903. He lived at 404 W. Tucker Street at his death.